Experience the Gentle Healing of Water at Health Quest Therapy! Patient enjoying benefits of hydro therapy. The safe and effective environment created by water minimizes joint stress to help reduce pain, muscle spasms, and swelling. Allowing rehabilitation and recovery to begin earlier than traditional land-based rehab alone. Patients can experience success even in acute stages of rehabilitation. 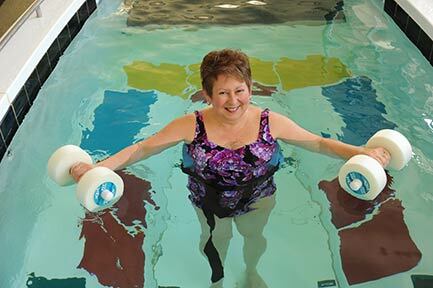 When combining hydrotherapy with traditional therapy, a patients flexibilty, function, over-all health, and well being can be greatly improved. 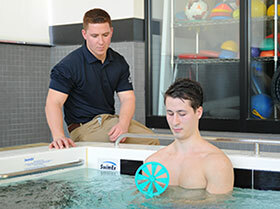 Water therapy programs at Health Quest Therapy consist of a variety of treatments and exercises performed in our state of the art therapy pool. Treatments are specifically designed to intensify the healing of your musculoskeletal injuries. Water Therapy treatment programs also serve to condition and improve overall muscle health, reducing the chance of reoccurring injury. Water therapy offers many of the same benefits of land based treatment programs, and are often used in combination to maximize the effectiveness of your treatment. The properties of water make it an ideal environment to treat musculoskeletal injuries. Buoyancy: Water assists in supporting the weight of the patient during immersion. This control can aid the development of improved balance and strength. Buoyancy also affords the patient a greater range and diversity of positions due to the near weightlessness effect of water. Patients who have trouble moving on hard land due to pain can move in ways they would never had been able to out of the pool. Viscosity: Water provided resistance by means of friction, allowing strengthening and conditioning of an injury, while reducing the risk of further injury due to loss of balance. Hydrostatic pressure: As the patients body is immersed the hydrostatic pressure created by the weight of the water improves heart and lung functions, making aquatic exercise an effective tool in maintaining and strengthening heart and lung functions. This pressure effect also aids in improving muscle blood flow. The combined benefit of these unique properties used in coordination with land-based treatments (when appropriate), allows Health Quest Therapy the opportunity to provide the most effective and comfortable treatment opportunity available.